When people ask you, what do you do?, do you have a clear, simple elevator pitch in your back pocket or do you find yourself stumbling on your words? If the people you’re talking to look confused, it’s time for you to ditch your old thirty second commercial. When you’re talking about your business you’re introducing your brand to the world. If you say what everyone else does, you sound like a generic brand which can only compete on price. #1. State the problem you solve. When you lead with a specific problem it immediately grabs the listener’s attention who struggles with that same problem, or knows someone who does. You want to articulate the problem you solve in one sentence. so great at marketing what they do. In one sentence introduce the name of your solution (or company name), who you help, and the transformation outcome result. My Solution Example: My online program, Power Biz Academy helps entrepreneurs attract high end clients just by following our 5-part Client Growth System framework. If you don’t communicate your difference people only remember you as a generic, mediocre brand. Click To Tweet In your new elevator pitch you want to limit your communication to one key point of differentiation. My Differentiation Example: Online programs are notoriously difficult for members to get personalized attention. Our Academy members don’t have to waste countless hours searching and waiting for answers. They’re guaranteed personalized attention every single week on live coaching calls. If you’re in a 1-1 conversation you want to end with a question, so you can engage them in the topic of your conversation. 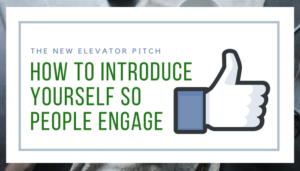 However, if you’re introducing your elevator pitch to a group of people, like at a networking event, you should pivot to a clear call to action. My Engage Example: Have you experienced any type of online coaching or training before? Remember your goal isn’t to share your entire scope of services. It’s simply to get them thinking, Huh, tell me more on one specific service. It’s also important to note that it is worth spending the time to craft a compelling elevator pitch that clearly communicates your brand. Just imagine you investing 1 Million Dollars to advertise your 30-second commercial during the Super Bowl. You wouldn’t settle for the first thought you jot down as you rush on to your next thing. So get started now and test out your drafts in the comment box below. Want to Avoid Sounding the Same as Your Competitors? Download this free Networking Cheat Sheet and start driving 10X more referrals!